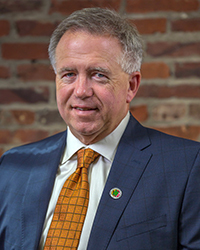 Mr. Mangum is CEO & President of Bell Nursery USA, a wholesale plant grower and distributor headquartered in Elkridge, MD, with offices and greenhouses across six states as well as the District of Columbia. Bell Nursery grows and ships tens of millions of plants annually, which are sold exclusively through the Home Depot. Mangum’s business maintains a longstanding relationship with over 30 farm families who grow annuals which are distributed under the Bell umbrella. He is a leader in the industry, and recognized across a broad range of local and national media. He has maintained a consistent commitment to helping others less fortunate, and believes that through personal involvement we can make a real difference in the future of individuals and groups. He is also known for his long-term involvement and support of: The Home Depot Foundation, United Way, Hospice, and the Believe in Tomorrow Children’s Foundation. This has led to his recent involvement with Truckin4Troops, a local group helping to connect with members of the military and their families at Walter Reed Warrior Transition Brigade as they recover from severe wounds received while serving in combat overseas. Whether it is boating on the Chesapeake, target shooting, or hunting and fishing, the goal is has been to bring a sense of normality into the lives of these troops and their families while they recover at Walter Reed National Military Medical Center (sometimes for years at a time). Recently acknowledged as the recipient of the Richard E. Hug Philanthropy Award, presented by the Maryland GOP, Mangum has now focused his attention on activities in west Baltimore where he has brought people in need together with community centers, by working with the Governors Office of Community Initiatives. Mr. Mangum attended the University of Maryland and Towson University.